This third article of the WW2 Special Packs previews presents the North American B-25 Mitchell, the allied medium bomber so named in honor of William ‘Billy’ Mitchell, a US Army general considered the “father” of the US air power. The B-25 Mitchell is famous for the Doolittle Raid of April 1942, when 16 of these bombers took off from the aircraft carrier USS Hornet, stationed in the Pacific, to attack the Japanese mainland. They were the heaviest aircraft at the time to take off from a ship at sea. The B-25 served with most allied air forces, including the RAF and the Soviet Air Force, but the vast majority served with the U.S.A.A.F. in the Pacific, where the Mitchell became a devastating ground attack aircraft. It was designed for the United States' Army Air Corps (USAAC) by the North American Aviation company. The first prototype, NA-40, flew in January 1939 and had shoulder-mounted wings and a crew of three in a narrow fuselage. It was destroyed in a landing accident but the development proceeded. To address stability problems and to meet the USAAC requests of a much larger payload, the North American designers moved the wing to the aircraft's mid-section, and widened noticeably the fuselage, with side-by-side seating for the pilot and co-pilot. The result was the prototype NA-62, equipped with two Wright R-2600-9 Cyclone (1724 CV) engines and featuring two vertical bomb bays and inverted gull wings. It was armed with.30 caliber machine guns – one in the nose, to be fired by the bombardier, three in the waist (top, left and right), and one .50 caliber gun in the tail, all to be operated by the radio operator. The crew was split among three stations – bombardier in the nose compartment, pilot, co-pilot and navigator in the main cockpit and the radio operation behind the bomb bay. This version received the name B-25 Mitchell. The B-25 constantly evolved throughout its production run, with several variants, as production numbers increased – nearly 10,000 were built during the war. So, the last version of most models was significantly different from the first. In 1939, the USAAC placed an order of 184 aircrafts based on the NA-62 prototype, but several improvements were done during the production batch. The pilot, co-pilot and bombardier were provided with armor behind their seats, and self-sealing fuel tanks were installed. 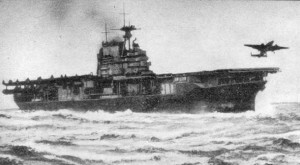 The defensive armament was increased, with the three waist guns and one rear gun replaced by two turrets, top and bottom, each mounting two .50 caliber machine guns. The top turret was a standard powered bomber turret, with guns mounted into a glass dome. The lower turret was a more ambitious weapon - a solid, retractable turret, aimed from above using a periscope. This was the version of the B-25 that took part in the Doolittle raid over Japan. The last aircraft from the first batch was delivered in January 1942. The variant B-25C was the first version to be produced under wartime conditions, and was produced in much larger numbers than the earlier models. 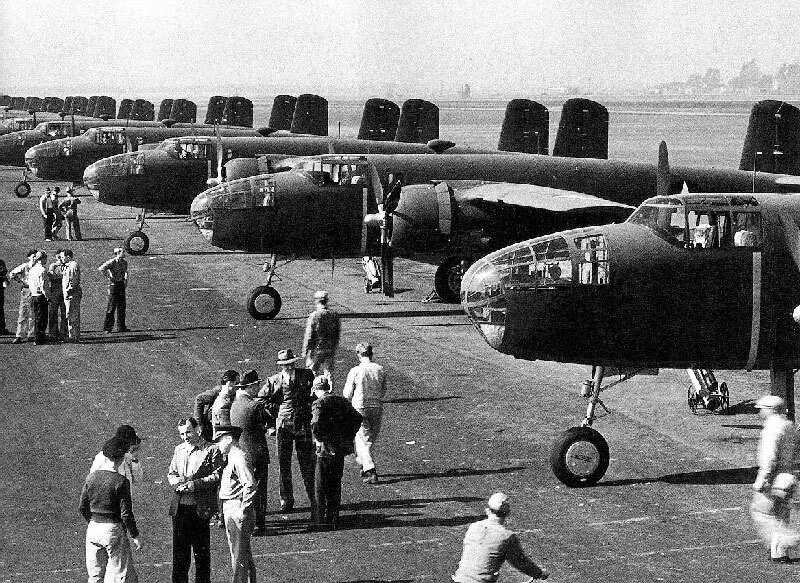 In total 1,625 B-25Cs and 2,290 B-25Ds (the same variant, just built in a different plant) were produced. The engine was changed to the Wright Cyclone R-2600-13 and the aircraft was also equipped with a cabin heater, improved instruments and a high pressure brake system. Another variant was the B-25G, built for low level strafing attacks, initially used against Japanese ships in the Pacific. The bomb aimer’s compartment with its distinctive windscreen was replaced by a solid nose, containing two .50 caliber machine guns, and a huge 75-mm M4 cannon. This variant was vulnerable to diving attack and the answer was the B-25H, with a complete re-gigging of the turrets that resulted in a very powerful ground attack aircraft. The B-25J was the last version and the one produced in the largest number – over 4000 were completed before the end of the war. It was built in two main versions. The majority had the glass bombardier’s restored, marking a return to the bomber role. A smaller number had a solid nose containing eight .50 caliber machine guns, for use in the ground attack role. Both versions retained the defensive firepower of the B-25H, with two waist turrets, one forward turret and a rear turret. The first B-25s were delivered to the 17th Bomb Group in the spring of 1941, and the first use in combat was on December 24th that year, sinking a Japanese submarine. The B-25s in American service were mostly used in the Pacific, where the aircraft’s potential as a ground attack aircraft was discovered and developed. The usefulness of standard level bombing was reduced and low level attack became the best tactic, with the ever-increasing amount of forward firing guns making the B-25 a formidable strafing aircraft. Also in the Pacific the B-25 proved to be a very capable anti-shipping weapon, sinking many of the ships being used to reinforce the Japanese position. The B-25s were often used in skipping a bomb on the water into the side of its target. And in the Pacific the B-25 became famous, on April 18, 1942, when sixteen of these aircrafts, all with volunteers crewmen and commanded by Lieutenant Colonel James Doolittle, took off from the aircraft carrier USS Hornet, flew over 700 miles (1200 km) to attack military targets in Japan. The raid inflicted some minor damage on four Japanese cities - Tokyo, Kobe, Yokohama, and Nagoya - and all the aircrafts were lost. But it was very important in the strategic sense, demonstrating that Japan itself was vulnerable to American air attack and working as a huge moral builder for the Americans who were in much need of a success. Still reeling from the devastating blow at Pearl Harbor four months earlier, Navy Captain Francis Low had hatched the plan to launch the USAAF twin-engine medium bombers at sea and have them land in China. Army Lt. Col. Doolittle signed on to lead the raid. The 16 bombers were modified, being overloaded with 1141 gallons of gasoline, with the ventral turrets removed and stuck black-painted broomsticks on the tail as dummy guns. They were carried on the Hornet carrier, which left San Francisco on April, 2nd to reach a launch point in the North Pacific, 400 miles from Tokyo. As they met Japanese picket boats well outside of that range, they were compelled to launch 10 hours earlier and 170 nautical miles (310 km) farther from Japan than planned. Despite the fact that none of the B-25 pilots, including Doolittle, had ever taken off from a carrier before, all 16 aircraft launched safely. The B-25s flew towards Japan, most in groups of two to four aircraft before flying single file at wave-top to avoid detection, and began arriving over Japan about noon - six hours after launch. They bombed 10 military and industrial targets in Tokyo, two in Yokohama and one each in Yokosuka, Nagoya, Kobe and Osaka. Although some B-25s encountered light anti-aircraft fire and a few enemy fighters over Japan, no bomber was shot down and then they proceeded to China to refuel, but faced unforeseen difficulties. The night was approaching, the aircraft were running low on fuel and the weather was rapidly deteriorating. Fifteen aircraft reached the Chinese coast after 13 hours of flight and crash landed or bailed out, and one flew to the Soviet Union, where the bomber was confiscated and the crew interned for more than a year. Eleven crewmen were either killed or captured. Thirteen entire crews, and all but one crewman of a 14th, returned either to the United States or to American forces. Despite the minimal damage inflicted, the raid soared the American morale, still reeling from the attack on Pearl Harbor and Japan's subsequent territorial gains. The Doolittle Raid inspired several movies, as RKO and The Purple Heart (1943), Thirty Seconds over Tokyo (1944), and Pearl Harbor (2001), and many books. The B-25s were also employed in the North Africa campaign, the invasion of Sicily and the advance up Italy, where it was used in a ground attack role, concentrating on attacks against road and rail links in Italy, Austria and the Balkans. The five bombardment groups that used the B-25 in the desert and in Italy were the only US units to use the B-25 in Europe. Besides that, the Royal Air Force received nearly nine hundred Mitchells. They entered active RAF service on 22 January 1943, and were used first to bomb strategic targets in occupied Europe, and - after the D-Day - to support the armies in Europe, with several squadrons transferred to forward airbases in France and Belgium. In total, B-25s flew 63,177 missions, dropped 84,980 tons of bombs, and shot down 193 enemy aircraft during WW2. After the war, many B-25s were used as training aircraft and also as staff transport, utility, and navigator-trainer aircraft. The last B-25, a VIP transport, was retired from the USAF on May 21, 1960. Approximately 34 B-25 Mitchells remain still flying today, most as Warbirds. In the next preview article, you will know how the North American B-25 Mitchell is featured in the WW2 Wings of Glory game. Information sources: Ace Pilots, History of War, Military Factory, Warbird Alley, WWII Vehicles, Wikipedia.